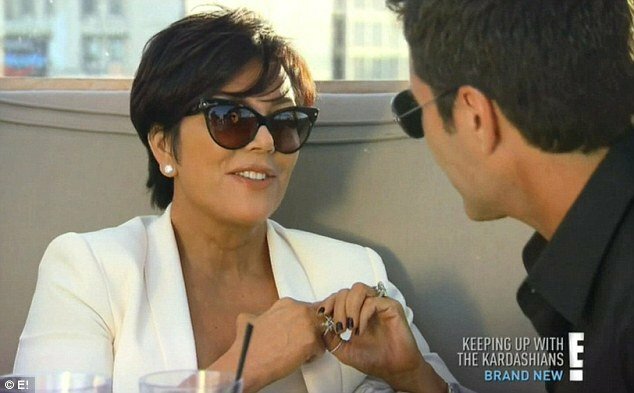 Kris Jenner met up with ex-lover Todd Waterman, the man who broke up her first marriage to Robert Kardashian Senior. Long suffering Bruce Jenner, 62, for his part, had been enjoying winding his wife up about his golfing sessions with red-headed supermodel Angie Everhart, 42. Kris Jenner, 56, had pushed him there, of course, by inviting her friend Lance Bass from NSync to dinner. But after running into gorgeous Angie Everhart, who Kim Kardashian described as looking like the titular character Ariel from Disney’s Little Mermaid, he was soon setting up a golf date. When he returned from the course, Bruce Jenner told a clearly rattled Kris that Angie Everhart is a “great golfer” and adds that “she got me on the last hole”. Livid Kris Jenner snapped that she doesn’t know what that means then asked for her dry cleaning, which Bruce realized he forgot. Meanwhile, Rob Kardashian is moving back into Khloe and Lamar Odom’s home after deciding he can’t buy the home he wants at the moment. He immediately annoys Khloe by filling her garage with his belongings after insisting he would only bring clothes to the home she shares with husband Lamar Odom. Kris Jenner tells her daughter that her husband’s golf partner is hot and that it’s “really starting to bug her”. Thus Operation Angie Everhart is born, and the mother and daughter spy team hurtle around Calabasas Country Club trying to catch a glimpse of Bruce and Angie. When they find them, Kris Jenner is devastated that Bruce looks so happy with Angie Everhart and loses it when she sees him slip an arm around the younger woman. The action cuts to a charity fundraiser where Kris Jenner says tells her friends she will meet Todd Waterman if Bruce is going to foster this friendship. They gasp and attempt to clarify: “Without Bruce?” and she replies with a resounding “yes”. Kris Jenner meets Todd Waterman as Bruce blithely plays golf. Both Kris Jenner and Todd Waterman blame the other for seeking them out but when he whispers in her ear that he’s been waiting for her for 23 years, her emotions seem to race out of control.